I once read a survey in an Australian landscaping magazine that listed the top five things you could expect to find in the average Aussie backyard – they were: a barbecue; a Hill’s Hoist (washing line); a dunny (outside toilet); a dog and a lemon tree. 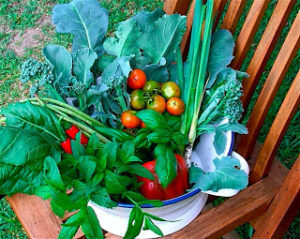 It tells you a lot about Australians and their way of life – and that gardening is not top of their list! However, I’m fortunate that my life as a horticulturist in Australia has been full of gardens and wonderful gardeners, and their passion for citrus trees is evident (not just the lone self seeded bush lemon tree!). Citrus are always top of the clients’ ‘must have’ list and questions about citrus always outnumber any other gardening questions. In previous posts about citrus I have discussed pruning and planting, caterpillars on citrus and how to deal with common pests (scale, sooty mould and aphids). 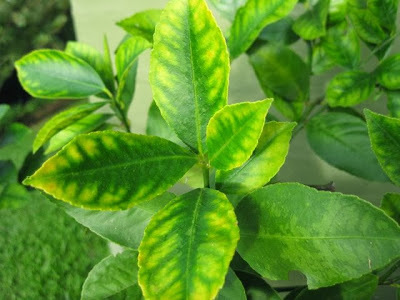 Lastly, I’m going to tell you how to recognize nutritional deficiencies in your citrus trees and what their feeding requirements are. 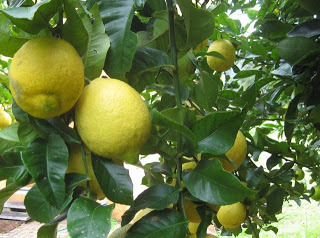 When it comes to giving citrus tender loving care there are a few basic principles – one of the most important is adequate nutrition – CITRUS ARE HEAVY FEEDERS. WHEN: Citrus have very shallow surface-feeding roots and require fertilizing three times a year in July, November and March. This is particularly important in areas of heavy rainfall where the soil rapidly becomes depleted of nutrients. That’s why it is also important to mulch them out to the drip-line to minimize soil run off and help maintain the nutrients in the soil. DON’T feed the soil while they are in flower otherwise you will have a lot of leaves and no fruit. DON’T OVERFEED – especially with nitrogen or you will end up with a lot of overlarge and thick-skinned fruit. WHAT: Citrus are heavy fruiters and take up a lot of the essential macro and micro nutrients out of the soil – they require the lot LITTLE and OFTEN. Potassium (potash) is essential for flowering and fruiting and a natural constituent of seaweed – that’s why regular feeding with a compost tea, that contains seaweed, or a seaweed concentrate is a good option for citrus. I would recommend the following mixed with 4.5L water for the three times a year feeding regime. Water in this mix around the drip-line of the tree – that is where the feeder roots are. Iron – a common deficiency in citrus with dieback of the new growth and intra-veinal mottling of the leaves. Nitrogen – Overall pale yellow leaves and lack of vigour. This is not to be mistaken for ‘winter yellowing’ where some of the leaves will turn yellow in the winter because the nitrogen in the soil is unavailable to the plant in cold and dry soils. The leaves will turn green again with the spring rains. Zinc – Yellow tipping of leaves. Copper – Dieback and dry patches inside fruit. 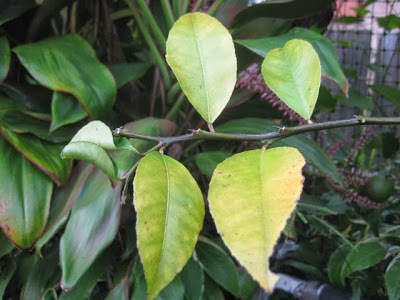 Magnesium – Very common and similar in look to iron deficiency ending up with a triangular patch of green at the base of the leaves leaving the rest yellow. 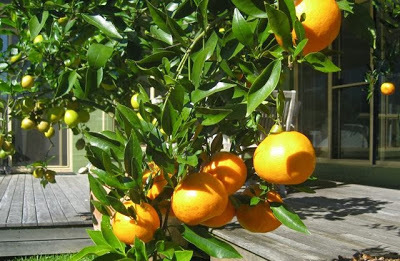 A NOTE ABOUT CITRUS IN POTS: Citrus have always made fantastic pot plants and have been grown this way for hundreds of years with large green house conservatories or ‘orangeries’ a part of a lot of the stately homes of Europe, where the potted citrus would be wheeled inside to overwinter. 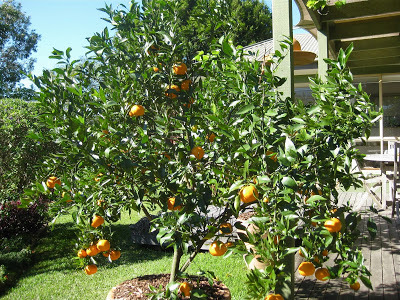 The roots of citrus in pots cannot go foraging for water and nutrients and require particular attention to keep them looking as healthy as the orange tree in the above photo. Enough water, but not too much and the right kind of food, but not too much. I would still recommend the above recipe three times a year with extra monthly waterings of a weak compost tea or worm juice drink. Choose an open and sunny spot to plant them – out of the wind. Mulch out to the drip-line. Feed regularly – not forgetting the essential trace elements. Ensure they are getting adequate water – particularly when the fruit is setting – dry plants mean dry fruit. Fantastic Diane, just what I needed, a great summary of citrus care, with photos …many thanks!